Ms. Fidelia Flor C. Mero of the University of the Philippines Visayas (UPV) shared that based on the results of their study, changing water every three days was effective in maintaining the rearing water quality, and improving the growth and survival of Perna viridis (green mussel) or ‘tahong' during pediveliger stage to spat rearing. Pediveliger is the stage wherein the veliger or the planktonic larva is able to crawl using its foot. It also demonstrated that higher survival and settlement rates were attained in the strongly aerated conditions. The study recommends that when larvae start to settle, it is appropriate to expose them to darkness, change the water every three days, and provide a strong aeration to be able to attain high survival and settlement rates and bigger spats. 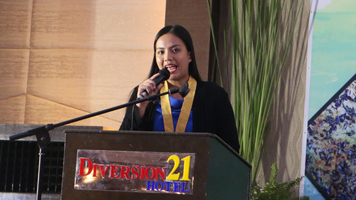 The research results were presented during the First Philippine Mussel Congress, organized by UPV through the support of the Philippine Council for Agriculture, Aquatic and Natural Resources Research and Development of the Department of Science and Technology (DOST-PCAARRD) in Iloilo City on October 25, 2018.
" Dr. Jorge Camara, a University of the Philippines graduate, made history as the world's first doctor to use teleophthalmology when he guided Dr. Susan Senft in removing an eye tumor via two-way, closed circuit television in 1999. "